At CES 2018, Polk Audio introduced Command Bar, a voice-controlled sound bar with the Amazon Alexa Voice Service built in. It’s due out spring 2018 for $299.95 and includes a wireless subwoofer, remote control and is 4K HDR compliant. Voice commands can set master volume, mute, bass, sound modes, and source selection through the Polk Connect Skill, or control connected smart home devices. When audio is playing at the loudest levels, owners can use the speak button in the remote control to lower playback volume and make it easier for Alexa to hear voice commands. On the back, Polk Command Bar includes a dedicated HDMI port designed to fit Amazon Fire TV devices and other HDMI streaming players with wide form factors. A built-in USB port in the rear panel makes it even more convenient to install USB-powered streaming devices, like Fire TV. The Polk Command Bar supports a full set of smart home skills to control lights, locks, and HVAC in addition to a variety of Amazon Alexa-supported music services, including Amazon Music, and can even read books from Audible. Support for additional music services will be announced later in 2018. Polk Command Bar integrate two 1.25 x 3.25-inch full-range drivers, two 1-inch tweeters and a ported, wireless 6.5-inch subwoofer for big, dynamic sound. The sound bar is compatible with 4K HDTVs and HDR via dual HDMI 2.0b inputs. Support for Dolby and DTS surround formats provides customers with an immersive room-filling home theater experience. Amazon Fire TV Compatible—An extra HDMI port is custom designed to fit Fire TV devices and other wide HDMI streaming devices. 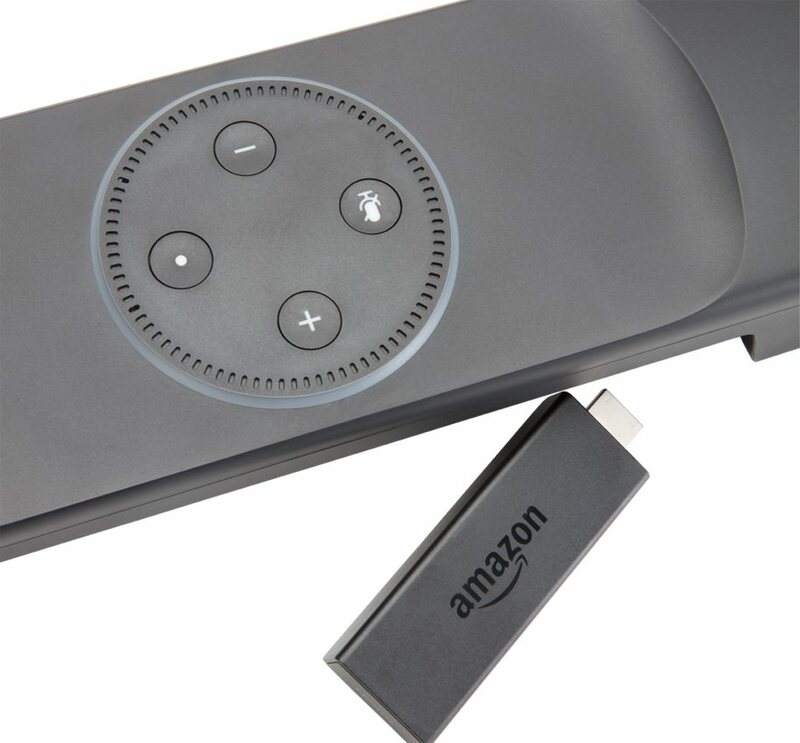 A built-in USB port can also power compatible Fire TV devices. Amazon Alexa Voice Control—At launch, customers will be able to simply ask Alexa to play music, control smart home devices, provide information, read the news, set alarms, read audiobooks from Audible, control Amazon Video on Fire TV, and more. The Polk Command Bar also features Universal control via HDMI CEC, IR Remote and Alexa voice commands. Alexa is always getting smarter and the Polk Command Bar receives automated over-the-air updates to provide customers access to new services and features. Connectivity— Supports Wi-Fi-and Bluetooth along with a full suite of wired inputs, two built-in 4K HDMI 2.0b inputs (Dolby Vision, HDR10 and HDCP 2.2 compliant), one HDMI (ARC) output and optical input for TV audio. It also ships with both HDMI and optical cables. Polk Voice Adjust for Crystal Clear Dialogue—Polk’s proprietary dialogue-enhancing technology, VoiceAdjust, allows consumers to isolate and adjust the voice channel for clear, crisp vocals. 4K TV Compatible—Works with 4K and HDTVs—plus, built-in dual HDMI 2.0b inputs ensure 4K HDR content looks great. 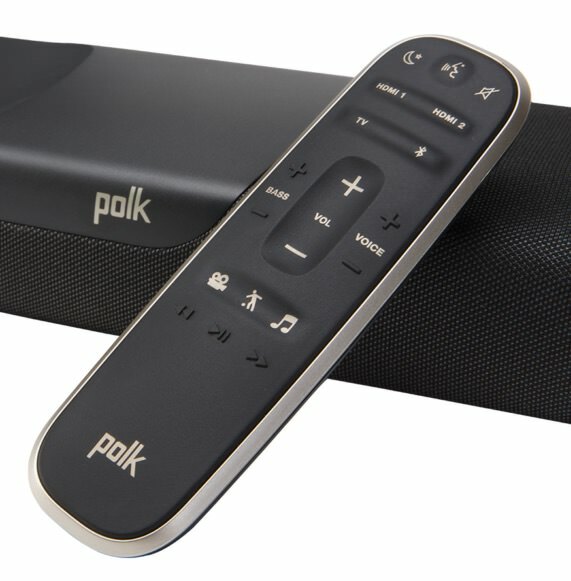 Polk Smart Remote Compatibility: Whether connecting via Optical or HDMI cable, Polk Command Bar features built-in support for popular IR TV remotes from Samsung, LG, Sony, and Vizio. It is also compatible with most CEC-enabled TVs. Optimized Sound Modes—The Polk Command Bar is outfitted with several preset sound modes for Night, Movies, Music, and Sports, which optimize the sound bar and subwoofer levels to ensure owners get the clearest dialogue, big room-filling sound and deep bass. Simple Mounting—Designed for both tabletop and wall-mounting with built-in keyholes slots for easy mounting. Polk Audio’s Command Bar will be available in the U.S. and Canada in the spring 2018 and will retail in the U.S. for $299.95. Preorders start April 1, 2018 at Amazon.com. It will be available in the UK, Germany, Australia and more regions later in 2018.